2 About 6 Seconds Background on Six Seconds Six Seconds (USA) is a not-for-profit organization founded in 1997 and dedicated to bringing emotional intelligence into practice in organizations, schools, and communities. The leading international advocates of emotional intelligence, Six Seconds has delivered effective programs on five continents. After two years of collaboration in Singapore, 6 Seconds SEA Pte Ltd was incorporated in 2003 to bring these exceptional programs to Asia. Six Seconds team has trained in leading organizations around the world, including American Express, Coca Cola, US Army, Standard and Chartered Bank, Holland s National Centre for School Improvement and Disney. Six Seconds Advisory Board members include Dr. Peter Salovey (Dean and Chair of Psychology at Yale University who first defined emotional intelligence as a scientifically rigorous concept), and Dr. Candace Pert (former Chief of Brain Science at the US National Institutes of Health who identified the molecular structure of emotions). 6 Seconds SEA Pte Ltd is a Singapore-based company with affiliates in the Asia Pacific region & the US. We are dedicated to ensuring the accelerated growth of peoples intellectual and personal development using a selection of effective tools from Energy Psychology, NLP and Emotional Intelligence, among others. Much of this stems from the inspiration gained from the benefits of studying, researching and practicing Emotional Intelligence. We believe that in order to achieve excellence, there should be acceptance and understanding of self and other and a passion for wanting to do more, whatever, whenever. 3 Karachi : Sep 23-24, 2011 EMOTIONAL INTELLIGENCE WORKSHOP Our competencies are governed by our behaviours -how well we can optimize these competencies. Cognition (IQ) leads to these behaviours-that determine how well we behave, which in turn determines how we can optimize our competencies and this inevitably determines whether we perform at peak performance. Much research points to the fact that emotions precede both cognition and behaviour and hence our first reaction to a stimulus is an emotional one. Emotions are one of our greatest assets. They help us make optimal decisions. They inspire quality in our decision making and are responsible for how we communicate and influence others, directly impacting what we accomplish as a leader and as a person. "Emotions drive people and people drive performance -Joshua Freedman" Emotional intelligence (EQ) is about understanding and interpreting emotions, how it influences and affects our daily decisions and directions. When discovered and internalised, it aids in the ability to empathize and work with others and manage stress. 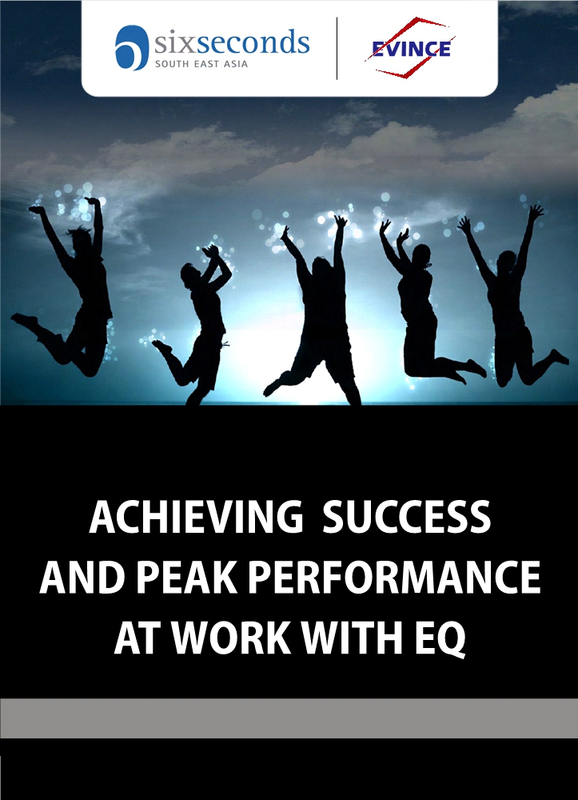 EQ elevates us toward our greatest potential by guiding us to Think, Feel and Act to the best of our abilities. EQ is the intelligent blending of our thoughts and feelings to produce optimal decisions for effective action. It is a skill and as with all skills, it can be trained and developed with practice. The level of EQ in a person reflects an individual's ability to deal with daily environmental challenges and helps predict success in life, both in professional and personal pursuits. EQ competencies include empathy, intuition, creativity, flexibility, resilience, stress management, leadership, integrity, happiness and optimism, as well as intra-personal and interpersonal communication skills. WHY THIS EVENT There has been an intense need felt to integrate EI in our diverse society with the intention to gain optimal results in business, families, schools and living life in general. Hence evince has stepped forward to bring you an opportunity that has never been held in the corridors of our country. In collaboration with the largest EQ network in the world, we are proud to partner with Six Seconds and make this a possibility. 4 Karachi : Sep 23-24, 2011 WHY WE ARE DOING THIS EVENT Organizations are made up of people, processes and property. By investing in processes and property, success is guaranteed through IQ. But extensive research has broken new ground and challenged that assumption and is increasingly proving that it is EQ with a blend of IQ which determines one's success. Recent research shows that emotional intelligence may actually be significantly more important than cognitive ability and technical expertise combined. Studies also indicate that EQ is more than twice as important as standard IQ abilities. For those in leadership positions, emotional intelligence skills account for close to 90 percent of what distinguishes outstanding leaders from those judged as average. 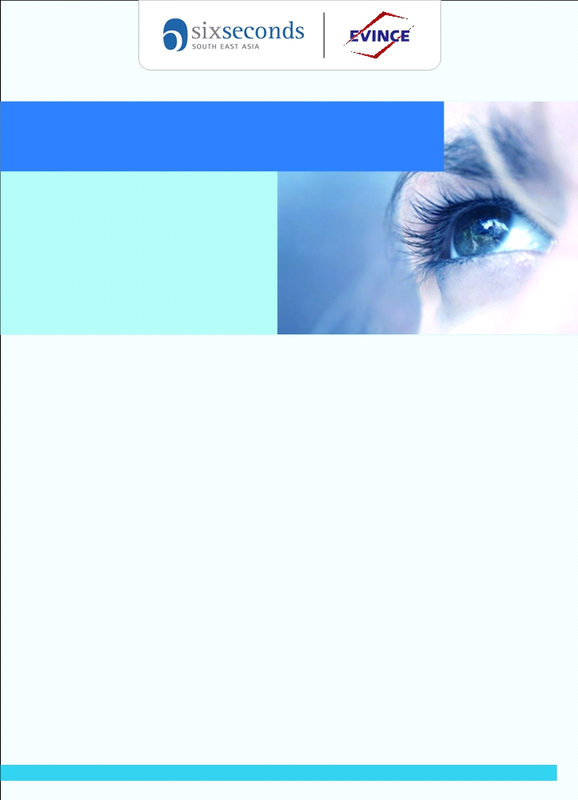 Emotional Intelligence is a skill and as with all skills, it can be trained and developed with knowledge and practice. This event will assist in the integration of their present competencies with essential EQ skills which has been a neglected ingredient of peak performance and successful people. WHAT ARE OUR COLLABORATIVE EFFORTS Six Seconds and evince will collaboratively host EQ workshops in Pakistan with the assurance that all events will be professionally conducted and facilitated by senior consultants using the Six Seconds methodology. WHAT BENEFITS WILL YOU GET OUT OF THIS EVENT This EQ event will assist organizations and employees to optimize their relationships with others by learning how to effectively manage their emotions, thus reducing problems with co-workers, disputes with managers, customer conflicts and sabotage. Given trends over the past decade, the people side will increasingly become the vital difference in competitive advantage. In discussing and exploring EQ and the corresponding competencies, participants will understand the essential ingredients that help build customer and employee loyalty, help people innovate and perform, help leaders build value and hence achieve world class performance. WHY SHOULD YOU ATTEND THIS EVENT? The Six Seconds model is easy to understand and focused on learning/development. Six Seconds developed the three-part model in 1997 to help people put the theory of emotional intelligence into practice. The SEI was developed and researched around the world providing a truly global perspective. The SEI measures eight fundamentals of EQ, including emotional literacy, emotional management, and empathy. The model integrates leading thinking on this emerging science into a practical, usable, memorable structure. So the participants will have the benefit of understanding this practical and easy to understand EQ model to integrate EI in their daily life and business. This opportunity will be available in Pakistan through the platform of Evince. 6 Karachi : Sep 23-24, 2011 SYNOPSIS Both managers and leaders are critical to the success of organizations. In an era of rapid change and complexity, organizations are finding they need more leaders who can engage people to take responsibility for creating better futures. Most managers have a high level of expertise on the technical side of their work, but few have substantial training in the human side of the job. Emotional intelligence provides the powerful insights and tools essential for transforming managers into leaders. Emotional intelligence (or EQ ) is the capacity to effectively use emotions, and it s a keydifferentiating factor of successful leaders. Why? Because relationships are at the heart of workplace performance, and EQ skills are what makes effective relationships thrive. Few training programs or workshops have the potential to make a significant difference in how participants perform on the job. This training program can. Studies vary, but all indicate that emotional competence accounts from 70 to 80% of the difference in leadership success. Maybe that s why thought leaders like Jack Welch (past CEO f GE) and Warren Bennis (leadership authority and author) and hundreds of others all agree: No doubt emotional intelligence is more rare than book smarts, but in my experience it is actually more important in making a leader. - Jack Welch In the fields I have studied, emotional intelligence is much more powerful than IQ in determining who emerges as a leader. IQ is a threshold competence. You need it, but it doesn t make you a star. Emotional Intelligence can. - Warren Bennis, author of Becoming a Leaders METHODOLOGY Using experiential exercises, reflection, case studies and dialogue, Six Seconds training provides a transformational learning experience where participants develop powerful new awareness and are guided to create practical action plans. Drawing on over three decades of proven experience in emotional intelligence instruction, the training draws on brain-based learning, multiple intelligence theory, positive psychology, and groundbreaking research on emotions. The training model comes from a curriculum called Self-Science, first published in 1978, which was hailed as one of two models for teaching EQ in Daniel Goleman s 1995 best selling book, Emotional Intelligence, Why It Can Matter More than IQ. 7 Karachi : Sep 23-24, 2011 A partner in enabling action for positive change through Emotional Intelligence. Granville is the Managing Director of 6 Seconds SEA Pte Ltd which he set up in Prior to that, he started Peak Performers Consulting Group in 1999 which presently specialises in Neuro Linguistic Programming and various processes in therapy. He is responsible for bringing 6 Seconds to Asia with a strong commitment to enabling others to cause positive change in themselves and others. Armed with knowledge and strategies to stir ideas into action through EI in 2000, he embarked on his mission to bring it down to Singapore and operate from here. He is presently planning for expansion around ASEAN. Granville has been helping organisations to approach their strengths and weaknesses through coaching and facilitative workshops that delve into team and individual behaviour. He uses various mechanisms like DISC, Harrison Innerview, Enneagram, MBTI and Baron's EQ-i to help participants understand innate behaviours and their personality traits. Such tools enable him to have a better hold on the factors that hinder performance so as to help influence and cause a positive shift towards reaching goals and aspirations. In addition, he actively uses EFT (Emotional Freedom Technique) to surface issues and help people cope with past incidents and challenges. His present programs are geared towards personal change and peak performance and include areas of Team Development, Communication & Behavioural Awareness, Emotional Intelligence, Coaching & Supervisory Leadership. His programs have benefited a range of clients from MNCs, government agencies, local and regional corporations. This includes Tan Tock Seng Hospital, Chartered Semiconductors, ASM Technologies, Minolta, Lucent Technologies, Hewlett Packard, Compaq, Nokia, Parkway Medical, Ngee Ann Polytechnic, AIA, Carl Zeiss, DHL International, Seagate, DBS Bank Singapore, M1, Motorola, UOB, HSBC, Shell, SIA, among others. Certifications with which Granville has been accredited include: - Certified to coach using the SEI Profile - Certified to administer DISC - Certified to administer Harrison Innerview - Certified to administer Reuven Baron's EQ-i Profiling Instrument - Certified 6 Seconds Level 1 & 2, and EQ Advanced Facilitator - Certified in the Enneagram - Accredited in the MBTI (Myers Briggs Type Indicator) - Certified to administer Hermann Brain Dominance Instrument - NLP Trainer with the American Board of NLP - EFT (Emotional Freedom Technique) Practitioner Level 1, 2, and 3 Granville has a Bachelor of Arts, an MBA, and a Doctorate in Business Administration from the University of South Australia. LEADERSHIP, MANAGEMENT AND BUSINESS SKILLS TRAINING UNLOCK YOUR PEOPLE POTENTIAL. For More Information, Please Contact Us At: Tel : +973 17643663 Fax : +973 17643113 E-mail : info@horizons-hrd.com Website : www.horizons hrd.